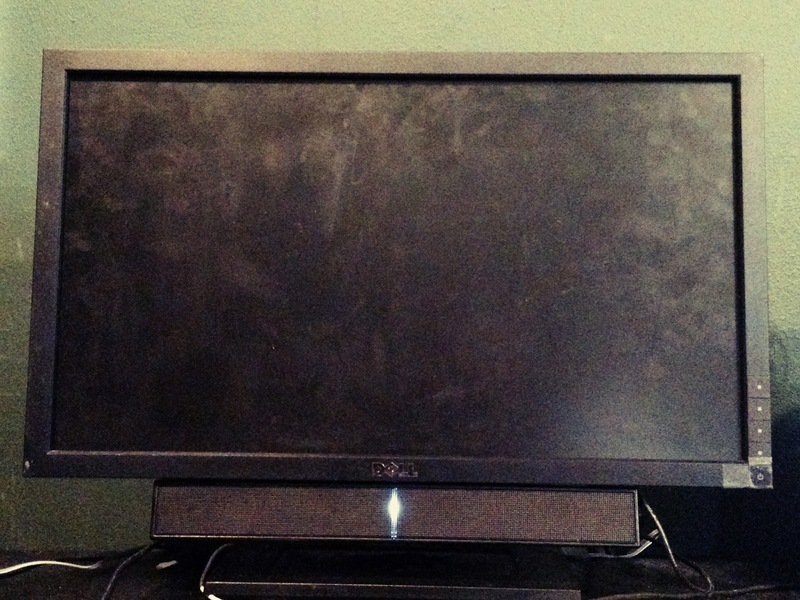 My Dell E2210H LCD monitor was really wonky. Powering up from sleep, it would only occasionally come back to life, usually after resetting itself several times. More often, it would power off or go into power saving mode, leaving the front panel buttons inoperative. Occasionally it would reset or power off while operating normally. Here's how I fixed it, using my DIY ESR test harness to find a bad capacitor without desoldering. You can find disassembly videos and tutorials out on the web specific to your monitor. Remember, safety is your responsibility so please learn how to safely deal with dangerous high voltages, how to safely discharge capacitors, etc. Low voltage drop; low ESR. Meanwhile, after disassembling, I used my Equivalent Series Resistance (ESR) Test Harness to identify bad aluminum electrolytic power supply capacitors. 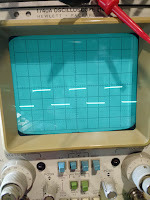 The device sends a 1.0 Vp-p, 1kHz - 250kHz square wave through a capacitor on the board while the oscilloscope displays voltage drop across the capacitor. You turn on the ESR harness, connect Channel 1 to the Probe BNC and Channel 2 to the Trigger BNC. Then touch the red/black probes to the positive/negative capacitor terminals while they are on the board. 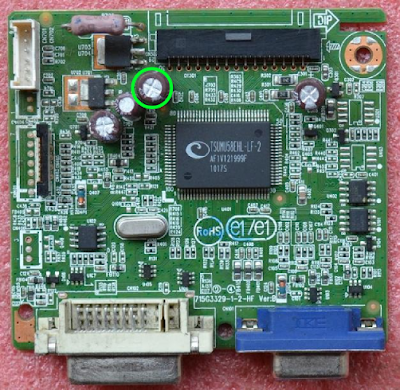 Which is nice; you don't have to desolder every cap. High voltage drop; high ESR. 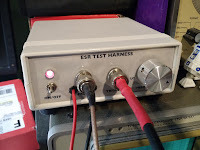 The harness incorporates a voltage divider, so you can compute ESR based on voltage drop and the harness' series resistance. But usually it's really obvious when you find a bad capacitor. What you should see is a very low voltage drop across the capacitor as pictured above right. A capacitor with overly high ESR will drop far more voltage as shown in the bottom right picture. And that is just what I found on one of the 100uF supply capacitors on the main driver board for the LCD. The rest of the capacitors tested ok. The bad cap looked fine but tested bad. Normal ESR for good capacitors of similar size are orders of magnitude less than that. 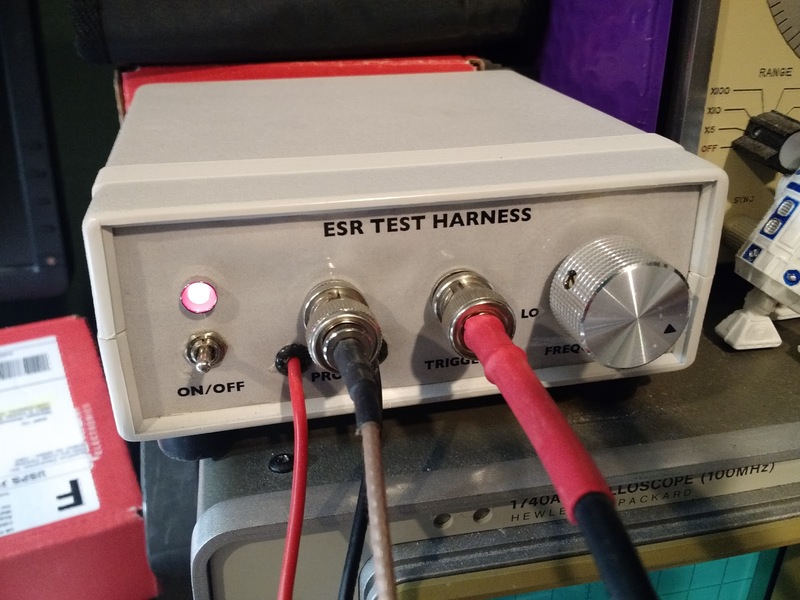 With such a high ESR, the capacitor was slowly charging and discharging, likely confusing whatever circuit or MCU was controlling the main power. 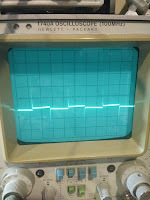 After replacing the capacitor with a good one, the monitor works normally, as expected. All with a minimum of work and the very low cost of a capacitor. Admittedly, I somehow missed the bad capacitor the first time I tested so I ended up buying a power supply board. Now I have a spare. Oops. I have 2 of these monitors. They both work for a while then black screen. Some times unplugging and plugging it back in will bring it back up for a few seconds. None of the caps look bad. I assumed the problem was in the PS and I was just going to replace all of the caps on that board but your post make me think it might actually be on the main board. I guess I need to get a proper tester. Thanks for the comment! As cheap as caps are maybe it is worth just replacing all of them on the PS board. 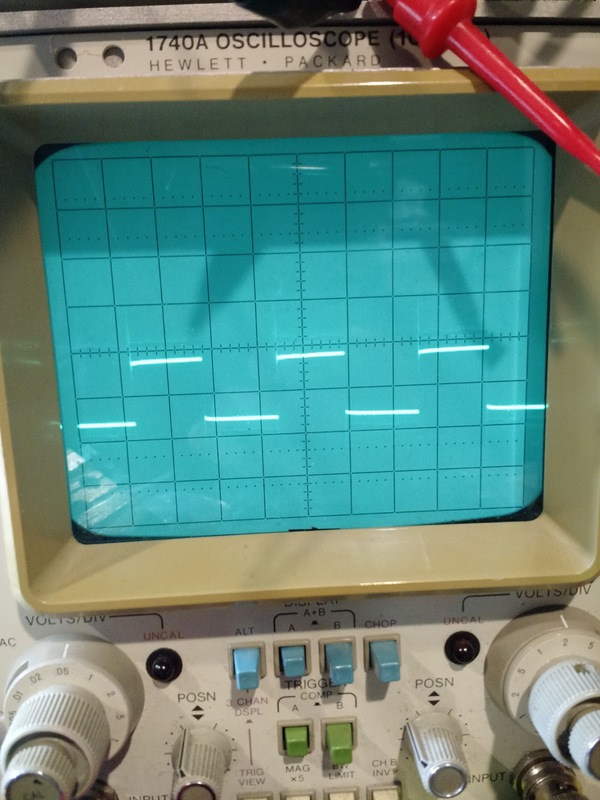 It isn't too hard to build an ESR test device if you have an oscilloscope already. A full meter is a bit more involved. 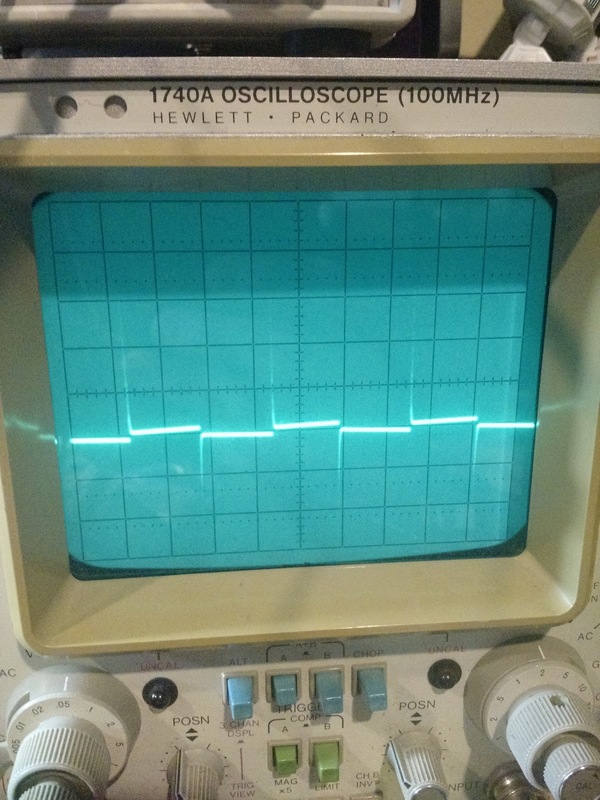 You could just as easily use a signal generator and set amplitude to say 0.1V to avoid turning on semiconductors.